The publisher says… Fox didn’t come to the library to read a book–he came to catch a mouse! 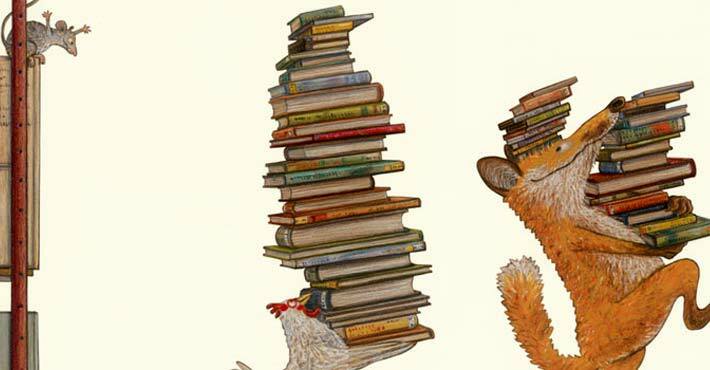 But when Mouse offers the fox a book, Fox gets all sorts of creative new ideas. Like eating chickens! Until Chicken points out that chicken bones are dangerous. But then all the animals must band together when the chicken eating, fox-hating-Farmer walks into the library. Eva says… So this FOX tries to catch this mouse in the library, but the mouse gets that fox READING instead! And then guess what? That fox catches a CHICKEN and he thinks THAT’S gonna be supper, but then you know what happens? The chicken TRICKS him! And that’s ALMOST the end so I better shut up or else I’ll spoil it. And you don’t want THAT. But now here’s what I think’s really WEIRD. Because people always act like foxes are sneaky and all that, but in a bunch of books I’ve read, like that one about the groundhog giving the fox cocoa and cinnamon toast (Brownie Groundhog and the February Fox), it’s those OTHER animals who trick the FOX. So I don’t know why people think that FOXES are the sneaky ones. It just sounds to me like everybody has a FOX PROBLEM. And I don’t know what to do about that. ← Synchronicity? Or something else?